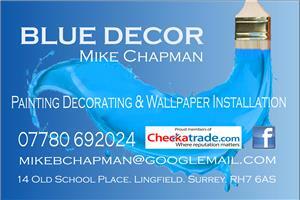 Blue Decor - Painter/Decorator based in Lingfield, Surrey. Invoice history based on 100 reviews. Blue Decor has been established for 13 years, working in Surrey, Sussex, Kent and South London. Painting, decorating, & wallpapering is the bulk of our work, we also tile & lay flooring to a lesser extent. The majority of our work over this period has been via recommendation. Our aim is to provide a quick, efficient service to our clients, causing them minimum disruption to their property and their daily routines. Our main work is residential, but we have undertaken commercial jobs on many occasions. We tend to use water based paints for the majority of our internal jobs these days to assist any clients that may have problems with odours emanating from oil based ones. Also work can be completed quicker as these paints are very fast drying, allowing our clients to have their decorated areas back to normal asap. Myself and my colleague Steve Robertson have many years’ experience in various building and decorating areas between us. If when viewing a potential client we feel we cannot adhere to their exact requirements or it is work that for whatever reason we cannot carry out we will always acknowledge the fact and decline quoting for the job. Thank you for taking the time to read our page today, we look forward to receiving your call.